Growing family? Need more space? Want to get into big boats without the huge price? This 1989 Moonraker is amazing. Her design is lightyears ahead of her time and one ideally suited to family life at Rotto. Moonrakers were the first boats in Australia to be built completely from Fibreglass component modules. Aside from the two dining tables there is no wood in the construction of this boat. None. This made these boats stronger, low maintenance and impervious to water. Major boat builders didn't move to this construction method for at least 10 years after these boats were built (and some still haven't completely because of the expense). What struck me was the size and space aboard. Her beam provides a huge amount of space in both her cabins, she has an enormous galley and a very spacious bathroom that you can stand up and, ladies, wash your hair properly. And best of all NO WOOD cabinetry. Every surface is easily cleaned, modern and solid. The forward cabin features a large V berth and full bulkhead and door, not a curtain. 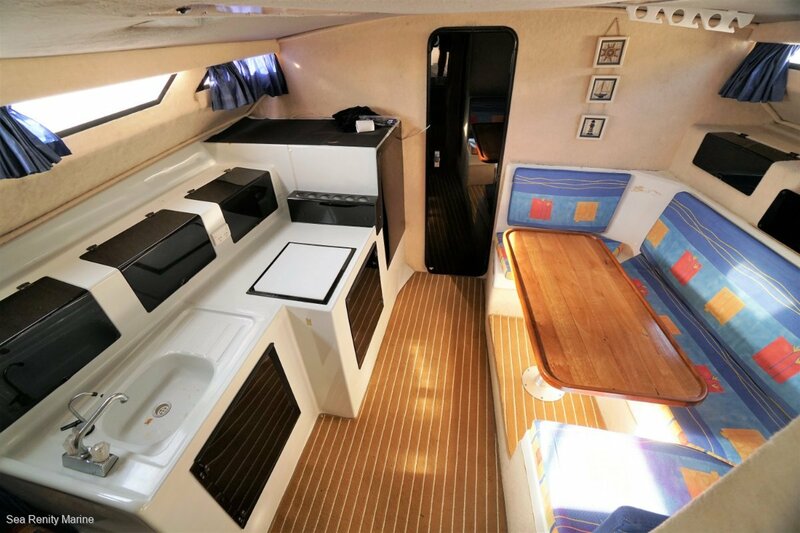 Immediately aft and to port is the dinette that can easily seat 7-8 adults (and converts to a double bunk), opposite is the fully moulded galley. The bbq cooker is up on deck outside (no cooking smoke and grease inside). Aft of this is the spacious bathroom and to Starboard and aft of the galley is the transverse double bunk and owner's lounge (great spot to read in winter). The carpet from stem to stern is newly replaced, heavy duty marine carpet. It looks great and is very functional ( spills aren't a problem). Up on deck and to port is a large lounge with table, opposite to starboard is the lower helm and cockpit sink. Aft of this is the flush cockpit and under is the spotless engine room. This main deck area is open to the cockpit like a sports cruiser but sheltered by the flybridge which I found really nice. New clears enclose this area and roll up out the way during the day. It makes this entire area the cockpit and works very well in real life (your kids can get out of the water and sit where they want without ruining anything; no parental meltdowns!) It is ALL moulded and easy clean and HAS been kept clean, not just spruced up for sale. The flybridge is covered by new covers, clears and bimini and has seating for the whole family. It feels very safe, especially if you have young children) there is plenty of room and great visibility. Yes, but what is pushing it you ask? Two very well kept Volvo 271HP AQAD 271C Petrol duoprop stern drives. She also has an Onan 3kVa genset in the engine room and there is actually room for your mechanic to get at the engines! These were serviced in September 2018, the legs recently rebuilt, Manifolds, elbows, Risers and bullhorns inspected and new hydraulic shift and throttle controls fitted. The engine room is spotless, and these engines are based on Chevrolet 5.7Lt V8s, so for there to be no oil everywhere means they have been very much cared for. Cruise speed is a comfortable 18'20 knots, WOT is 42Knts. The vessel was recently lifted, antifouled and propspeed applied and is ready to drop her lines and go. The layout is very clever and has the best of both Flybridge and Sportscruiser designs without any of the drawbacks. If you're in the market for a family boat that won't break the bank and is practical, comfortable and easy to own here it is. Call Matt Pearce on 0488 026 244 to arrange a viewing. Yes manual. Owner has new electric unit not fitted. Fantastic layout, years ahead of it's time. Great family boat in excellent condition.